The descent, from here, should have led us to the plateau that would have taken us to our final summit, Glyder Fawr. 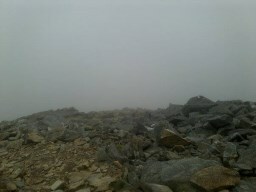 But unfortunately the cloud became so thick that we could not see very far in front of us. As the weather was obviously not going to life any time soon, and as the time was approaching my cutoff point, I made the decision to get off of the mountain. It was one of those decisions which experienced walkers make - the mountain would still be there another day. Carrying on carried the risk that we would become another statistic needing to get rescued from the mountain as we had got lost in the cloud, or suffering from hyperthermia. I had spent a long time planning my route over the previous few months. I'd watched YouTube videos as well as studying maps, and now knew that we had four options. The cloud was so thick we couldn't find two of the routes, so we went off the right hand side which went under the cloud cover. I knew from the maps that there were 2 ways down from here. I calculated I had one and a half hours to find a safe path down - if this did not work out and came to a dead end, then I had two hours to get back up again and find an alternative route. We started off following the track, but it then disappeared, and the ground became unsafe. We decided to follow a stream instead. Although it was a bit hairy at times, this part of our walk ended up being the best part of the day! Getting down via the streams meant we had to grasp the grass whilst digging our feet into the bank as if it was snow, then working our way over the rocks in the stream, bank to bank and tree to tree. Finally we made our way to the bottom where we then had to get over a couple of farmers' fields to get to the main road. 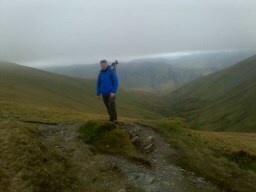 Simon is an experienced walker, and there are points to note in his review below. 1. Good route planning, including knowing different routes should you need to change your plans, and knowing the daylight time available for walking on the mountains. 2. Being prepared to change your route, even if it means not achieving your goal when the weather changes. 3. Although routes look straightforward on a map, they may not be so simple in practice! 4. Like Simon, always take a map and compass with you! Once again we're grateful to Simon Laughton for sharing his walking experiences with us. Our plan was to climb from Elidir Fawr to Tryfan, parking the car at Pen Y Pass to catch the Sherpa bus to Nant Peris. We thought we'd got to the car park in good time, but even this time of the year it was full at 8.30 in the morning, but we managed to park at the bottom of the road. After the Sherpa bus had dropped us at Nant Peris, we started our walk proper by crossing the bridge using the newly laid tarmac path. In the first field we headed towards a style next to an overhanging tree which marks the starting point of the track leading up towards three slag heaps. A bridge takes you over to the other side of the stream. The next part of the walk was going to be quite strenuous, so we stopped for a while and took on some much needed water and energy food. When we started off again we found the terrain going onwards was over boggy grass land, and the track was disappearing on and off. About half way up we found the partly worn track that leads to the summit of Elidir Fawr. Making our way to the top we found the last 200 yds or so found us picking our way across a boulder field, but the at the 3,031 summit there was a very welcome wind shelter where we paused for a moment to catch our breath and have a bite to eat. We then set off again this time working our way across the ridge - a large boulder field which slowly descends to a narrower ridge of the curve around to the Glyders. From here we began the near vertical climb over very rocky ground of the ascent to Foel Goch (2,726 ft). Coming down from the top, following the path we turned right at the style at go back to Glyders ridge. 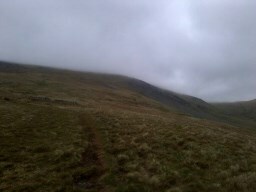 If you walk this in low cloud it's very difficult to see the path as it's a grassy track running over a short plateau. It did make a nice change from the rocks and boulders for a while, and eventually leads to Y Garn at 3,107 ft. The final push to the summit is over a worn path through yet another boulder field and rocks. Strenuous, but worth it, and again there was a stone wind shelter to rest for a while.